First, much of the litter items we see—aluminum cans, straws, plastic bags, etc.—are lightweight and easily blow off of garbage trucks, landfills, and off the tops of recycling and trash cans. How often have we seen overflowing bins with trash spilling over onto the sidewalk? These items are also easily transported during rain events, when rain carries them downstream and into watersheds, usually ending up in lakes, rivers, and oceans. Therefore, even items that are properly disposed find their way into local neighborhoods and critical habitats alike. Second, many other nations do not have formal waste systems like we have in the U.S. Companies like Unilever and Nestle have targeted these regions by selling them items in an “affordable” manner by packaging them in small sizes, such as deodorant, shampoo, and candy. 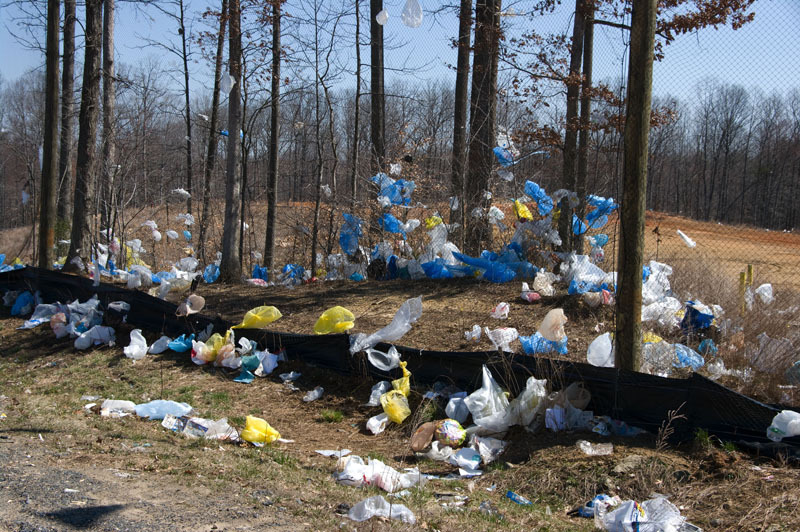 This results in large profits for the corporate giants but leaves residents in a sea of plastic trash. Finally, even when plastic trash is properly disposed and goes to its intended destination, it still causes problems. Plastic that is sent to landfills mixes with organic waste, which causes plastic residues to leach into the soil and groundwater. Conversely, plastic that is sent to an incinerator is burned, which emits toxic fumes into the atmosphere and decreases air quality. We have also had many partners and community members tell us that they do their part for the environment by recycling their plastic. As commendable as recycling is however, it is simply not enough. The life cycle of disposable products and the harm that comes with it is much more than meets the eye. First, petroleum must be extracted from underground, much of which is located under critical habitats. Then, materials must be hauled in trucks—which emit pollutants and carbon dioxide— to processing plants, which require energy and water to transform the raw materials into products like coffee lids and utensils. The finished products are then transported hundreds of miles to their place of use, where they are typically used for about 20 minutes or less before being thrown in the recycling bin. From there, the items must be hauled once again to a recycling facility hundreds or often thousands of miles away to be transformed once again, which requires even more energy and water, before being carried yet again by truck or barge to another destination for use. Even with recycling included in the cycle, the whole process destroys habitats, emits pollutants and greenhouse gases, spends energy, and wastes water. Thus, the issue is not just with certain people and their behavior; the issue is that there are just too many of these plastic items in the first place. By eliminating these items from our daily routine, we curb their profitability and thereby reduce and ultimately stop their production. The surefire way to prevent litter, groundwater contamination, air pollution, and harm to marine life is to get rid of single-use plastics from the start. Spread the word! Help others understand why recycling and disposal of plastics still have negative impacts on the environment. Through our ReThink Disposable program, Clean Water educates and partners with businesses and individuals how to tackle the true culprit—plastic itself. For more information on our work or to get your business involved, visit www.rethinkdisposable.org. As we wrap up Plastic Free July, we hope you gained a few new plastic-free habits that you can continue to implement throughout the year. Have a sustainable summer!